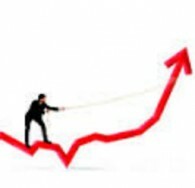 Many people do that, as a matter of fact, but, of course, the really prominent buyers are those who are professionals in any field concerning sleep. So let me tell you just one thing: 18 top hotels out of 20 use Simmons mattress. 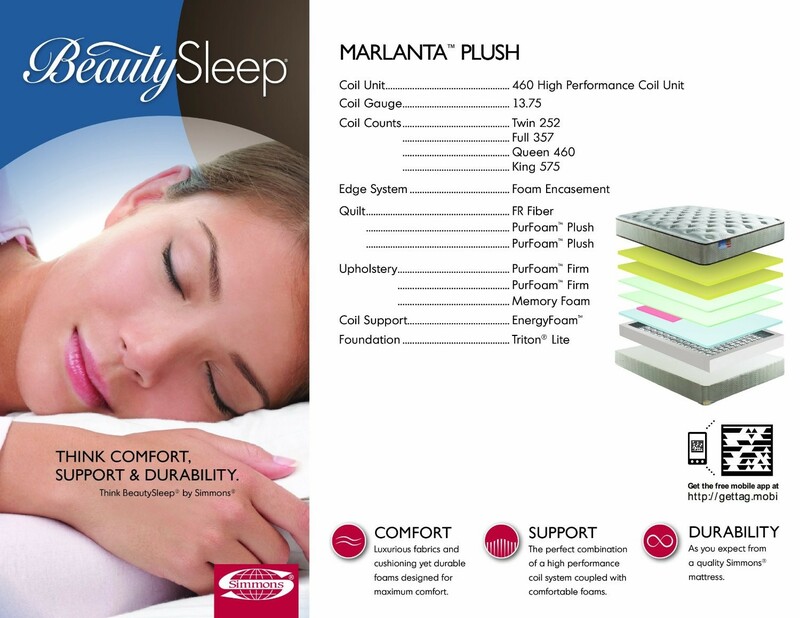 Their mattresses are some of the best innerspring mattresses in the world. The best place to buy a mattress is Amazon.com. If you don’t agree, you may see there and familiarize yourself with my opinion about that. Of course, I’m not saying it’s always the best place, but it usually is. Anyway, since it is the best place, I give you the list of best Simmons mattresses available there, which, incidentally, represent BeautySleep and BeautyRest lines. This innerspring mattress is a bit firm. That’s not to say it’s hard as a rock, nothing like that. But it’s definitely not soft either. The mattress comprises a multitude of layers. The first layer is made of fire-resistant fiber. Then come comfort layers. Depending on the variety, it might be an inch thick single firm comfort foam layer or two comfort layers made of plush comfort foam, each 1 inch thick as well. The next layer is the upholstery layer comprising two pieces of firm comfort foam. Depending on the variety, the thickness of those two pieces differs as well. But of course, neither the quilt layer nor the upholstery layer is what is the most interesting thing about this mattress. That would be the coil system. Their quantity depends on the size of the mattress: 512 coils for Twin Size, 1064 for King Size. Thanks to such a large amount, the coils easily provide perfect support. And, since they are pocketed coils, they do a great job at eliminating motion disturbance. But despite that, the edges don’t collapse when pressure is applied to them since they are encased in foam to prevent just that from happening. 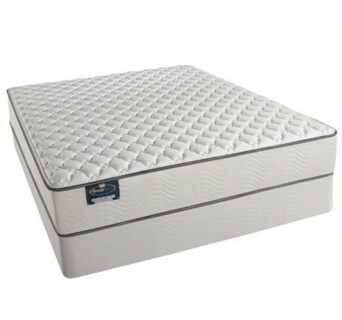 If you’re looking for a Simmons mattress, I really suggest you buying this one on Amazon.com. 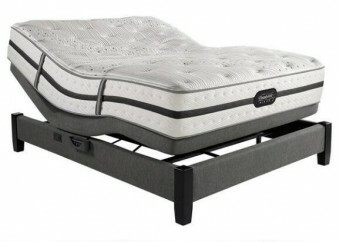 Another innerspring mattress from Simmons, also presenting the BeautySleep line. Unlike the previous mattress, this one is not firm. In fact, it’s quite soft, as the name itself indicates. What should I describe first? Perhaps, the cover fabric would be the best bet. After all, it’s rather unique. It’s not as even as most other covers are. The fabric is stretch knit—and that’s not unusual for any mattress—but what’s more important is the circular design the fabric possesses. As you can expect, it’s textured, and thanks to that it gives you the feeling of massage. Despite that, the fabric is soft and luxurious to the touch, rather than roughish. However, the uneven surface might be considered somewhat of a disadvantage by some people. But if you don’t mind such design, you can make your order on Amazon.com right now. If you are not convinced yet, consider this: in addition to the luxurious knit cover you get a heavy gauge coil system to support your back, and an enhanced edge support system as well. And that’s without the Visco memory foam back guard, which is also there for your comfort. Now this is what I call a hybrid mattress. Maybe, it is not all that correct to call it that, seeing how it’s a pillow top mattress, but to think this pillow top is that luxurious… That’s hard not to recognize it as a real hybrid mattress. Jokes aside, while not a hybrid mattress technically, it might just as well be one. 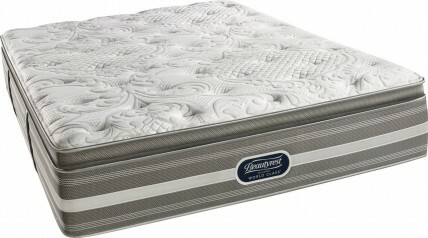 The pillow top comprises memory foam technology, whereas the base layer on the mattress has hundreds of pocketed coils. All in all, the mattress incorporates such technologies as AirCool Memory Foam Technology, gel-infused memory foam TruTemp Technology and Beautyrest Pocketed Coil Technology. 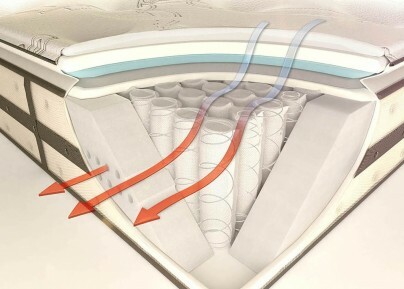 AirCool memory foam functions just like any other memory foam, providing all the support you need, at the same time reducing your pressure points, but the most important thing about it that has a design to let air flow through the mattress, thus making it cooler to sleep, and adding more breathability. If that sounds to you like a good mattress to buy, then don’t waste your time and do just that on Amazon.com. The only issue you’re likely to have with this mattress is that the textured pattern is too pronounced. But on the other hand, that same pattern might make the mattress better for your back in the long run. A mattress to wake fully charged and ready for the day. 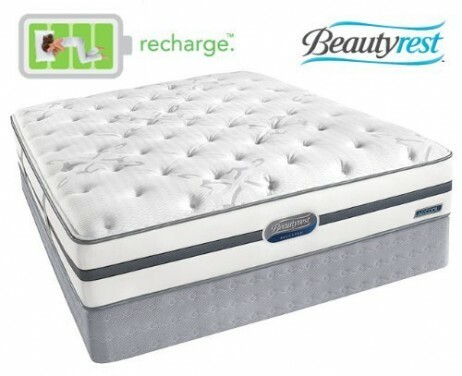 Beautyrest Recharge Luxury Mattress gives you perfect support and comfort. With this mattress, you have almost every material type at your service for your sleep. 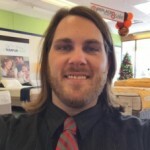 You have memory foam, namely AirCool foam for support, pressure relief, and ventilation, gel foam for drenching heat and cool sleeping, then you have a latex band for more supple support and relieving quite a number of lumbar problems, and then there is the coils system for motion transfer elimination and enhancing the support even more. The mesh border prevents the edges from collapsing when pressure is applied to them. All in all, this is a good mattress. The only issue there is about it is its firmness. The mattress is nominated as firm, but the problem is it might be firmer than you think. Nevertheless, while firm, it’s a memory foam mattress, even if partially, and it’s the memory foam unique qualities that help you distribute your weight as fully as possible, relieving pressure points in the process. And, of course, let’s not forget about the knit cover, which is, while not silky, still good to the touch. If you would like to order this mattress, you may proceed to Amazon.com to make your order. Here comes the best of Simmons mattresses. This mattress represents the BeautyRest line. The very cover is a bit of a contradiction. It is fluffy, but at the same time, it’s quite firm. And when I say it’s firm, I mean it. You would be hard pressed to find a mattress harder than this one (unless you were to read my reviews on firm mattresses). But that’s good if you like sleeping firm. Besides, firm surface is a good choice to relieve many kinds of back pain. But despite being firm, the mattress is not hard. Even the quilting comprises not just a luxury foam layer (wich is indeed firm) but also a GelTouch for cool sleeping. But then there are comfort layer, one of which is made of energy foam, also used for edges support in many Simmons mattresses, and Dynamic Response Memory Foam. Then there is the support system. It comprises hundreds and hundreds of coils, up to 1116. Thanks to the very quantity of them, your back will always have properly distributed support. The coils system is encased in AirCool foam for extra edge support and ventilation. This is just the thing for you if you want a good, firm mattress to welcome you when you come home, sore and tired. Don’t hesitate and order it on Amazon.com right now! 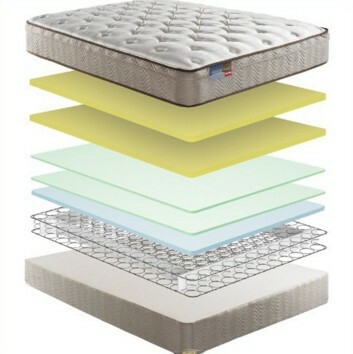 Simmons mattresses have many features unique to them, but the best mattress they make are innerspring mattresses with all kinds of variations. The company makes good hybrid mattresses, and they pay a lot of attention for keeping the temperature balanced whenever they employ memory foam. Even though they active use pocketed coils technology, they always use edge support systems, usually foam encasements.